We had great fun during the 2010 World Cup watching the stars shine on CNN's Twitter Buzz. The more a player, team or topic was tweeted, the bigger their picture on the screen. 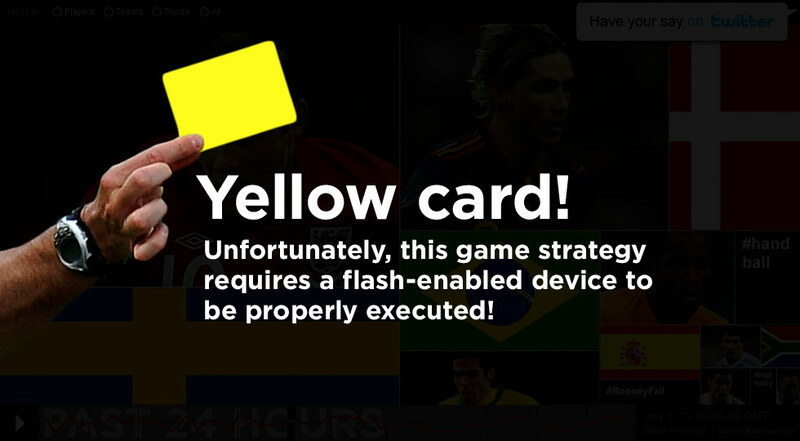 Updating every few seconds, players would rise and fall with every goal or red card, along with referees, celebrity fans and of course the vuvuzelas. During the tournament, we curated more than 11 million World Cup-related tweets. And at its peak, the interactive processed more than 13,000 tweets a minute when England played the U.S. on June 12. Here's your chance to track the tournament again, from the opening ceremony to the night Spain lifted the World Cup. @pedrocnn The day has arrived! Kick-off is just a few days away. The atmosphere around soccer city is electrifying. The world cup party has started! @BenWyattCNN Just gone through the turnstiles-noise sounds like walking into a beehive. Stadium is awesome site. @BenWyattCNN USA given standign ovation by their fans-a performance of character from Bradley's men-England with some thinking to do. @IshaSesayCNN Robert Green fumble with ball is a horror. Should make list of world cup moments of shame! @JoeMcCurdyCNN Day 3 at FIFA WC: the atmosphere surrounding Soccer City is truly atmosphere-intense wind is creating a dust storm. We can barely see it! @JoeMcCurdyCNN Fans beer is overflowing on to my head. Don't care!!!! Slovenia 2 USA 2!!!! @McKenzieCNN These players should be up for Oscars, not World Cup. @RobynCurnowCNN OMG-streets of SA empty. Whole country stopped to watch game. @GeoffHillCNN Bafana Bafana fans out but not down-the South Africa fans told us they were proud of the team and looking forward to the rest of the World Cup. @pedrocnn Gourcuff sent OFF! This nightmare continues to get worse and worse for France. Can Domenech resign during the half time please? @McKenzieCNN What happended to the big guns?? Could the World Cup see a new winner. @pedrocnn After yet another goal line gaffe, I hope the next WC features some kind of technology to help refs see if the ball goes in or not. Have something to say? Add to the conversation by tweeting your comments to @worldcupcnn!